WBZ reminds us today is Truck Day. 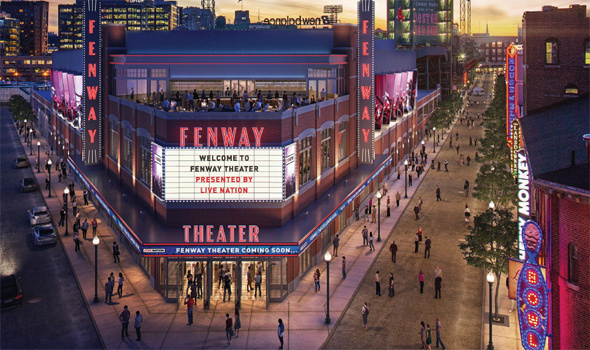 The Fenway Sports Group, which owns the Red Sox and Fenway Park, yesterday filed a letter of intent with the BPDA to build a new entertainment venue next to Fenway Park between Lansdowne and Ipswich streets, behind the Fenway bleachers, to "host a wide variety of entertainment and civic events on a year-round basis." Read more. 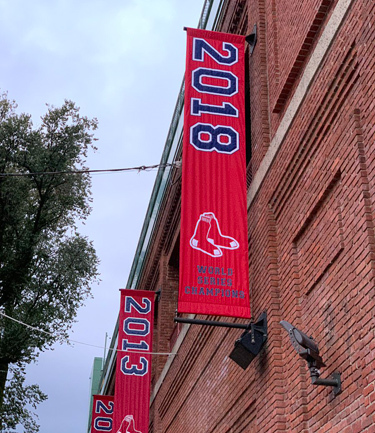 KMV shows us the newest banner hanging from Fenway Park this morning. 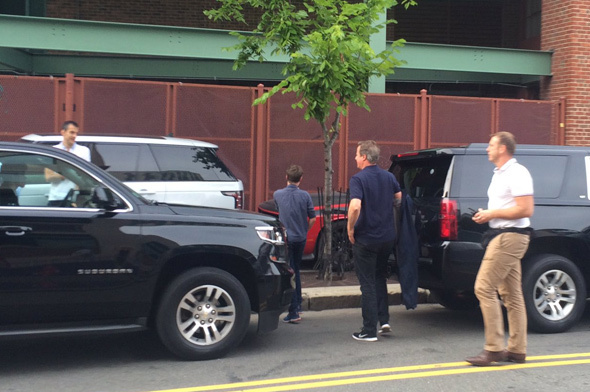 Adam Castiglioni spotted former British Prime Minister David Cameron heading into Fenway to watch his two favorite ex-colonial teams: Boston and Philadelphia. The Foo Fighters are playing Fenway Park tonight and, short of a biblical flood, tomorrow. 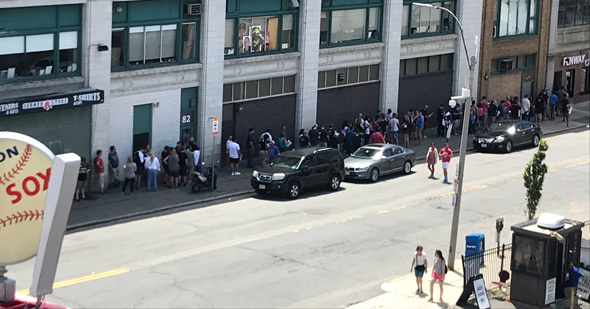 Jeff Maker has a good seat to watch the line outside the pop-up Foo Fighters store on Brookline Avenue (where the Tilted Kilt and Copperfield's used to be). Maureen Rogers recounts taking in a trio of Irish hurling matches at Fenway yesterday. For the first half of the Galway-Dublin match, we tried to figure out the rules by just watching. My brother Rick, who played pretty much every American sport growing up, was able to pick up on some of the rules as we went along, figuring out the difference between a 1 point play, a 3 point play, and a 5 point score, and picking up on the fact that there seemed to be some sort of rule similar to dribbling with respect to how long you could hold the sliotar (the ball) in your hand. But at half time we gave up and went to the Google. It was just too much of a struggle to try to guess what would be called a foul. Apparently, whacking someone in the head with a hurley is perfectly okay. Early on Aug. 13, a woman standing in Club Cafe, 209 Columbus Ave., had her buttocks grabbed by a male employee. Read more. 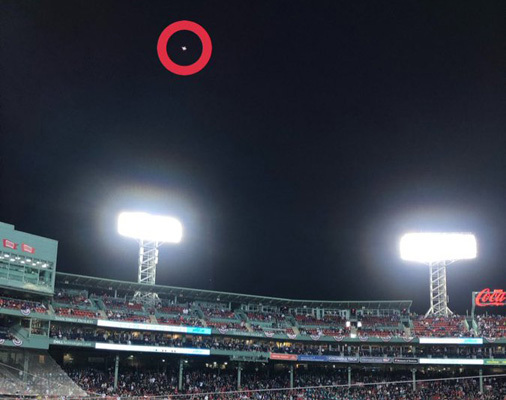 Marla M. spotted this pair of lovebirds at Fenway Park last night. Copyright Marla M. Posted in the Universal Hub pool on Flickr. Joy of Sox recounts the Gamblers' Riot, 100 years ago today. Update: Hennick has made his Facebook feed private, but the Globe report quotes more extensively from his original account. At the game, Jones got a small ovation from the crowd when he was introduced (and a much larger one before his first at-bat, when the stands had filled in). But after a young Kenyan woman finished singing the Star-Spangled Banner, the middle-aged white fan next to me leaned over and said, "It was too long, and she niggered it up." Maybe now we can have a moratorium on guys proposing to girlfriends at sportsball matches? It finally happened! @RedSox game 'proposal in front of Bud Light logo' got awkward quickly. She wasn't excited & Sox cut to random shot! The Red Sox yesterday won city permission to host eight concerts at Fenway Park this summer, starting with the Dead and Company on June 17 and 18. The Red Sox wanted to host twelve concerts, but city licensing head Christine Pulgini said nope after a hearing last month at which Fenway residents and City Councilor Josh Zakim said they didn't sign up for lots of concerts at Fenway on top of 81 Sox home games. Read more.